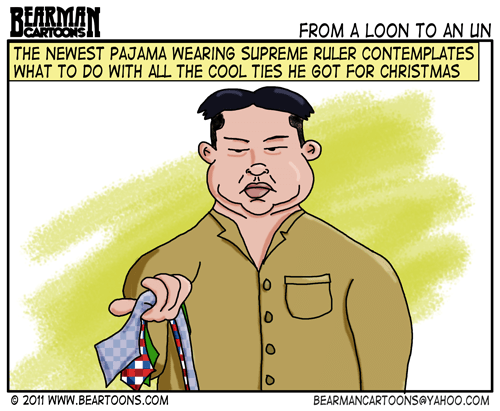 Kim Jong Un is back in the news again this Christmas so thought it was time to reshare this cartoon I did in 2011 when he took over as Supreme Ruler in North Korea. Seems there is some issues that North Korea has with Sony Pictures “The Interview” starring Seth Rogen and James Franco. The premise being the two stars are hosts of a tabloid show and when invited to do an interview with Kim Jong Un, are recruited by the CIA to turn it into an assassination plot. In turn, North Korean hackers, hacked Sony leaking private emails and personal employee information along with a slew of other secrets the company would probably have liked the world not to see. And most recently the North Koreans have placed the blame for the production of the movie on the US Government itself, claiming the government helped get the movie produced as a propaganda piece. Don’t they know our government doesn’t have a sense of humor. Aren’t you worried you’re going to get hacked by even intimating there might be something different about their leader (TIC)? Merry Christmas Bearman! Looks like Sony is going to release the movie after all. I’m happy about that. But will you see it? The deeper implications are rather disturbing. Great likeness Bearman but you made him a lot better looking than he really is. Now I must remember that movie to find & watch. I always like CIA movies. I think all political leaders should wear pajamas. The hacking story seems to have more twist and turns than the movie probably has. I know what he can do with them. luckily a theater only 2 miles away is going to show the movie so if something happens…. Are they government party ties?